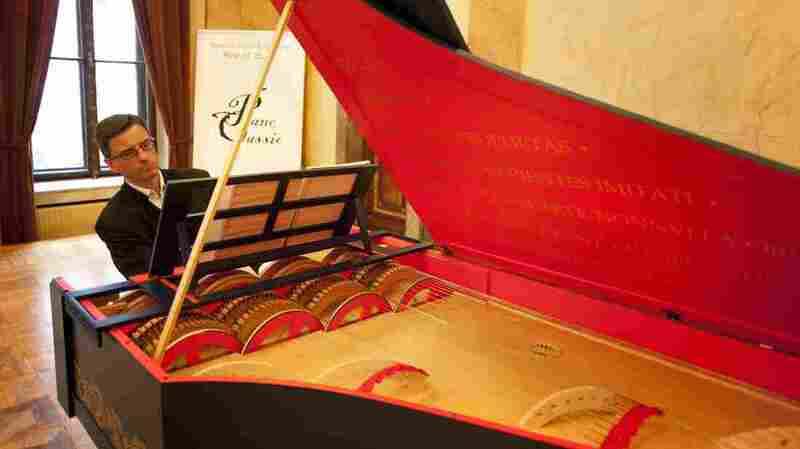 Da Vinci's String Organ Must Be Heard To Be Believed : Deceptive Cadence Polish pianist Slawomir Zubrzycki has brought one of Leonardo da Vinci's lesser-known inventions to life. He spent almost four years building the "viola organista" — a unique musical instrument that looks like a piano but sounds like a quartet of string instruments. Pianist Slawomir Zubrzycki presents the "viola organista" on Oct. 18 in Krakow, Poland. Zubrzycki spent almost four years building the instrument, which is based on a late 15th-century design by Leonardo da Vinci. The man who painted the Mona Lisa, and was the first to sketch out the helicopter and the submarine, also dabbled in music. So here's the question: What musical instrument did Leonardo da Vinci design? There isn't an easy answer. His 15th-century sketches indicate something between a harpsichord and a cello, where spinning wheels of horsehair run along the strings. He named it the "viola organista." Leonardo never did build the instrument. Others tried, with varied results. Now, after four years, Polish pianist Slawomir Zubrzycki has managed to bring the curious instrument to life. Last month he unveiled the organista, revealing its unique sounds to an enthusiastic audience in Krakow, Poland. "The drawing by Leonardo da Vinci that is the basis for this instrument," Zubrzycki recently told the AFP news agency, "is not a technical drawing. It does not contain all the necessary information. But it is more than enough to understand the concept of this instrument."